Everyone who tuned in for The Walking Dead season 8, episode 8 - "How It's Gotta Be" - surely knows what's coming when the show returns for its midseason premiere on February 25. But for the rest of you, take a moment and sit down, because some real heavy stuff is about to hit the fan. At the end of S8E8, Carl Grimes lifted his shirt to reveal a bite wound, marking him as... well, a bit like a walking corpse. 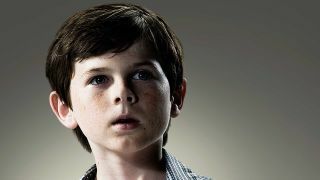 With no cure or antidote for the zombie virus in the Walking Dead universe and a 100% mortality rate, Carl is a goner. It's always hard to say goodbye to a beloved character, but this one stings extra hard for a couple reasons. First, not many really saw it coming - in the Walking Dead comic series, Carl is still alive. The TV show has mixed things up before, but such a major character biting the dust when his counterpart didn't is unexpected, to say the least. It's also hard to stomach because this means we'll also be saying goodbye to Chandler Riggs, who has played the character since season 1. He's literally grown up with the role, playing it since he was 10 years old (he's 18 now). Executive producer Greg Nicotero, who is directing the show's midseason premiere, recently spoke with Entertainment Weekly about what to expect. "It’s never easy because you can never really understand what they’re going through," Nicotero said. "There’s never really anything you can say that will make them feel better. You just really, really want to make sure that they have an opportunity to show people what their character was made of. Between Michael Rooker and Chad Coleman and Sonequa [Martin-Green] and the people that have brought so much to the show, it’s really making sure I honor them and give them that opportunity." Nicotero also said that he was tearing up in the editing room as he was making the cut, and I imagine many viewers will be doing the same when they watch it. I admit I haven't really kept up with The Walking Dead for a few years now, and maybe you're the same way. But even so, and even if the franchise continues for decades to come, there's no way I'm going to miss this episode. I'm not going to miss my chance to say goodbye to... *sniffle* CAAOOWRHHLL! !